So for today’s topic I feel a little limited in what to write about. It seems other bloggers have had tons of experiences with diabetes and can draw upon many memories, good and bad, to write about. I only have less then a months worth of experiences to conjure up, opposed to years worth like many bloggers. It feels like almost every day creates a new memory for me. Take last week for example: 4 days last week I got less than 3 hours of sleep per night because my blood sugar kept dropping below 55 and my Dexcom sensor kept beeping at me (I felt fine even at 50, but not fun). So I had to change my Lantus dosing and have caught back up on sleep. And today, I ate the same things and took the same amount of insulin as previous days that I had consistent blood sugar readings, in the 80-90 range, but today I somehow dropped into the 50’s and couldn’t even begin to guess why. So everyday is a new memory and learning experience. But to write about my fondest memory, I will recap my story for everyone who does or does not know it. I was diagnosed with type one diabetes on April 22, 2013. About 3 weeks leading up to my diagnosis and subsequent hospital stay, I began to get sicker and sicker. I lost about 50 pounds in 2 months, I got fatigued to the point of having to lie down/nap after walking up the stairs, I got dehydrated, I could never retain any liquid and I urinated all the time. I did not know this at the time but these are symptoms of Diabetic Ketoacidosis (DKA) and this is what put me in the hospital for a night. But the scarey thing is that I was going on with everyday life despite being as sick as I was. I was driving myself around, going to class, going to work, and I even went to the gun range and shot shotguns with my brother (yikes!). But luckily nothing bad came from the guns or the driving. After several weeks, my weight loss never ceased, I never started feeling better, so it became time to go to the doctor. I met with the family doctor and he took my blood and made me pee in a cup, and just by my urine gave me a 98% chance I was diabetic due to the quantity of blood sugar in my urine. Just to be sure, he gave me prescriptions to fill for insulin and told me how much to take, then sent me home till the blood test results came back the next day. He called me 3 hours before our appointment the following day to tell me to come in and see him. He tells me what I already have figured out: I have type one diabetes. He also tells me if he could have done something differently he would have put me in the hospital the previous day because the blood tests show just how sick I actually was. So here began my night of no sleep, IVs, blood being drawn every 2 hours, and blood sugar tests every hour at the hospital. The main reasons I was put into the hospital was for the DKA, dehydration, and low (bordering no) potassium. Something about DKA depletes and doesn’t allow you to absorb any more potassium. The worst part of the whole hospital stay were 10 IV bags of potassium, which do not feel good at all being pumped into your veins. The potassium must be thicker then the other IV fluid because it hurt. It felt like something was so cold in your veins that it burned. I hope no one has to experience this, it is not fun at all. So that is my fondest diabetes related memory, and probably always will be. It’s the day my life changed forever. But hopefully in the years to come, I can accumulate many more good memories then bad ones, especially related to diabetes. 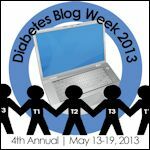 This entry was tagged Blood sugar, DBlogWeek, dexcom, Diabetes Blog Week, Diabetes Blog Week 2013, Diabetes mellitus, Diabetes mellitus type 1, Diabetes Online Community, Diabetic Ketoacidosis, DKA, DOC. Bookmark the permalink. I love reading your perspective as a new member of the club. Hope your overnight lows get better. Do you take lantus at bedtime or in the am? When I was taking it I took it in the am and would always drop about 12 hours later. Doc said lantus hits its peek at 12 hours so that was why I was dropping. We ended up splitting my dose for am and then at dinner… Worked out well. Thank you! I am glad you like my writings! I take my lantus at 5:00pm every day. I was taking 15 units but because of the low during the night, i dropped back to 13 units. I see an endo for the first time next monday so i can talk things over with him.